Today we went and got our Christmas tree, which I can't even believe I"m saying since my brain can't catch up to the fact that it's December! It's been kind of a rough day, I'd originally planned to make a roast duck and for us to have champagne after we'd decorated the tree, but we went to a friend's party last night and enjoyed ourselves a bit too much. I woke up at 3 am dehydrated and with a headache and have been awake ever since. My hubby had errands that kept him later than intended, so I scratched roasting the duck (my stomach just wasn't even in that mode anyway). We finally went to the lot by our house and were able to get a really beautiful Grand Fir. It's heavy and sappy as hell, but it sure is beautiful and fragrant! 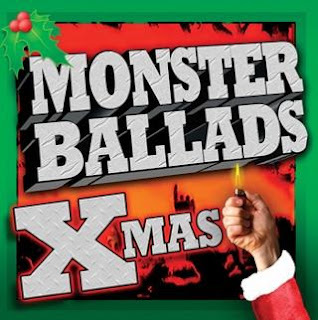 Lots of fun stuff on here, but my favorites are Jani Lane's versions of "Have Yourself a Merry Little Christmas" and Winger's version of "Happy Christmas, War Is Over". I like to mix it up with other fun songs like "Christmas in Hollis," Everclear's version of "Santa Baby" and some of the traditional Burl Ives, Dean Martin type stuff. Even our fish Axl got his living quarter spruced up with a Santa and some Christmas lights. I think he likes the lights, he's been very active since we put them around his tank. Either that or he thinks he's on acid. ;) He's kind of small, but he's at the bottom of his tank and a greenish yellow. This is my favorite picture of the night. This is our dog Natasha, who I love and adore, but she is the definition of an old dog who has run out of give a damns. She's 14, blind in one eye and we think she may be losing her hearing, so I can't quite blame her for acting like a little old meemaw sometimes. Anyway if you are dog owner, you know the best part of Christmas is being able to torture your dog with some sort of antler or hat contraption. In our case it was antlers with jingle bells on them. Doesn't she look mega pissed? I kind of don't blame her, the poor dear faithfully got up with me at 3 am this morning and has mostly been awake ever since, and we were especially bumming her out by taking over her sleeping area with our Christmas cheer. We couldn't resist though. On another note, my fitness and eating this past week has been really horrible. I am hoping to be able to get more into a routine once the weekend is done, but I fear that may not be the case. It has unfortunately been a tough month for me, and I am a little ashamed to say that I will be happy when the holidays are done. It's not that I don't love Christmas, but it's tough to get into a rhythm when you are pulled in 9 different directions. I still am highly motivated, but also have to give myself a break for sanity once in awhile.